The Amsterdam Museum Linked Open Data set is now a part of the Europeana ThoughtLab, a showcase of the technologies developed by the Europeana partners. The Amsterdam Museum Linked Open Data is a prime example of Linked Open Data of the type that Europeana will be producing. AM as LOD is one of the datasets available for the Apps for Amsterdam challenge. Apps for Amsterdam is an initiative to open up and use data about the city of Amsterdam. The apps-design competition runs up until 4 may 2011. We here list some example URIs. Pointing your web browser to these will redirect to a view of the cultural heritage resource metadata in the EuropeanaConnect Semantic Layer. 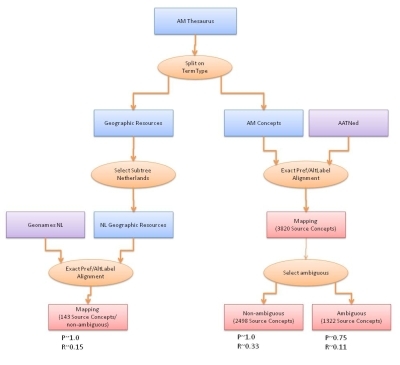 The local view of the resource shows a selection of the metadata for a resource, an image (if available) and a part of the surrounding graph. Currently, the 'full view' option is only accessible when the resource is found using the search or browsing and not through the PURL redirect. We are working to fix this. Alternatively, you can use a semantic web application to retrieve the RDF describing the resource. http://purl.org/collections/nl/am/proxy-54832: Een protest-shirt afkomstig van de plek van de moordaanslag op Theo van Gogh (T-shirt found on Theo van Gogh's murder scene). http://purl.org/collections/nl/am/proxy-38596: Prent "De Grote Markt van Haarlem" (Print depicting Haarlem's market square). We provide a first alignment of the AM thesauri to (Europeana) Linked Open Data vocabularies, thereby linking the Amsterdam Museum to the LOD cloud. To generate the mappings, we use the AMALGAME tool, which is under development at VU Amsterdam. We aligned the concept thesaurus as well as the people database. We present the initial results below. Further work is needed to determine the exact quality of the mappings and to derive more mappings using the tool. The links can be explored through the Europeana Semantic Layer. In the near future, we will add sample queries here. The concept thesaurus is mapped to two thesauri: the geographical concepts are mapped to GeoNames concepts (only the Dutch subtree) and the rest is mapped to a Dutch version of the Art and Architecture Thesaurus (AATNed). We only use links that have a relatively high estimated quality (based on an informal sample evaluation). This yields 143 links to GeoNames NL and 2498 AM concepts linked to AATNed. A further 1322 links can be presented for human evaluation. The People database is also mapped to two thesauri: a subset of DBPedia containing persons and the Dutch subset of Getty's Union List of Artist Names (ULAN). Again we only select links with a high estimated quality. This results in 1076 AM persons matched to ULAN and another 34 matched to DBPedia. Additionally, low-precision mappings are found that can be checked by human evaluators or used for further automatic processing. The data is also accessible through a SPARQL endpoint, where a form can be found for manual testing of SPARQL queries. Machines should use /europeana/sparql/?query=..., which provides a SPARQL compliant HTTP API. Returns all objects with dc:subject "Delft"
We are pleased and excited to announce that the complete Amsterdam Museum collection is now available as Linked Open Data (LOD). The data was retrieved from an XML Web API of the museum's Adlib collection database and converted to RDF compliant with the Europeana Data Model (EDM). This makes the Amsterdam Museum data the first of its kind to be officially converted and made available in this format. The results are more than 5 Million RDF triples describing all of the more than 70.000 cultural heritage objects related to the city of Amsterdam described by the museum. 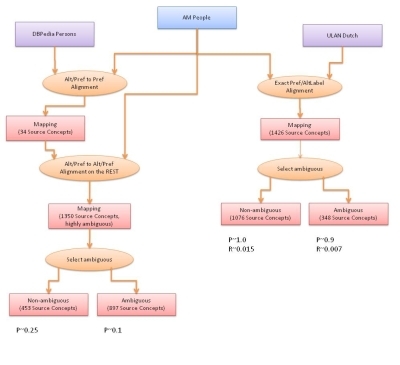 The conversion into EDM was done a two-step process, using the XMLRDF conversion scripts. In the first step, the XML is converted into 'basic RDF', every node in the XML tree gives rise to a RDF blank node, with attributes and sub-trees being mapped to property-subjects. In the second step, the basic RDF is converted to EDM-RDF, using XMLRDF rewrite rules. In this step, AHM records are converted to EDM Proxy/Aggregation/PhysicalThing triangle. The metadata describing the cultural heritage object is attached to the Proxy. Here you find information such as Title, Creator, Subject and Creation dates. The Aggregation is used to list the meta-metadata. This includes the creator of the proxy-metadata and other provenance information about the metadata. The Aggregation is also used to link to the data provider's (in this case AHM's) landing page and/or image thumbnails for the cultural heritage object. PhysicalThing is only used to established identity links between objects presented by varying data providers. You can browse the data through the Europeana Semantic Layer, use the SPARQL endpoint or use your favourite semantic web application to retrieve semantic data. This RDF version was based on AM Collection Data, the AM persons and concept thesauri as distributed by Amsterdam Museum. The conversion script and software was written by Victor de Boer, Antoine Isaac, Jacco van Ossenbruggen, Guus Schreiber and Jan Wielemaker. Part of work presented here was funded by the EU through the EuropeanaConnect project. CSS design adapted from on NodeThirtyThree.